Born in Kassel, in 1816 Paul Julius Reuter created one of the world’s first international news services. 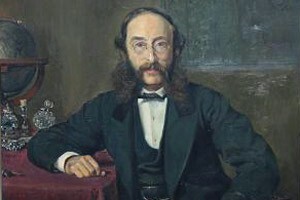 His original name, given by his Jewish parents was Israel Beer Josaphat, which he changed to Paul Julius Reuter after he moved to London and converted to Christianity in 1845. In the following years Reuter moved back to Germany and shortly after to Paris where he worked as a translator, but returned to Germany again. He founded a news agency in Aachen and invented the so-called pigeon-post that he used to transmit messages between Aachen and Belgium using central telegraphic transmission and carrier pigeons. In 1851, Reuter established a telegraph office at the Royal Exchange Buildings in London’s financial center, from where he transmitted stock market quotes inderal between London and Paris. During this time he recognized the need for a news service, so that he spent the following years working on his agency “Reuters” and on promoting his services to several newspapers. After reporting several exclusive stories, he built up a strong reputation and extended his company’s service to the entire British press. Throughout the following year Reuter was able to extend this business worldwide. Even after his retirement at the age of 61, Reuter remained active and saw the news agency he founded grow and flourish until he died on February 25, 1899. In 1999 the Reuters News Agency launched a university award in Germany in remembrance of the 100th anniversary of the death of Paul Julius Reuter.